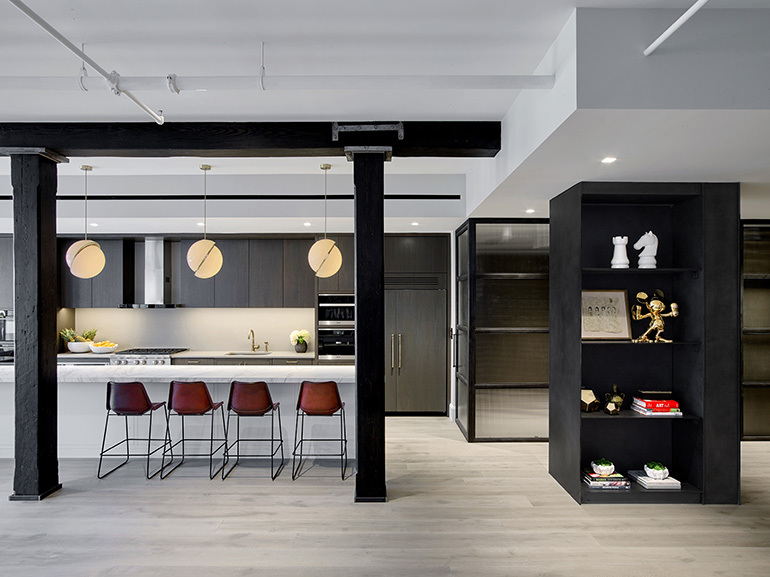 Minimal and industrial-inspired kitchens set the scene for seamless food preparation. That's what they're designed for anyway, right? 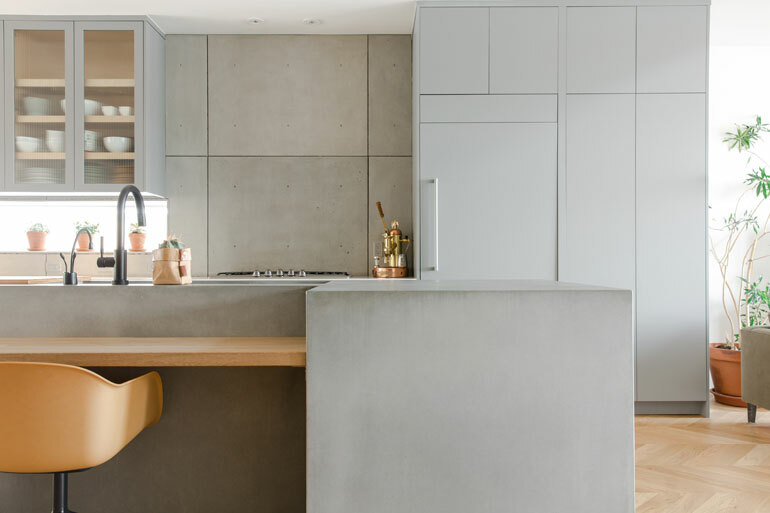 Here are 20 pared-down kitchens that combine simplicity and sophistication. This project was an honoree for the 2018 Best of Year award for Mid-Size Apartment. 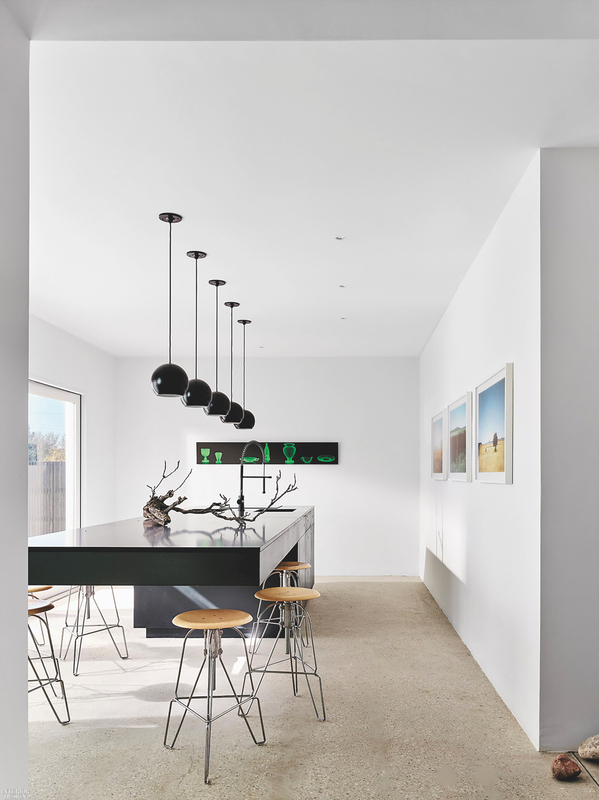 In the kitchen, stools by Sol & Luna are lit by Lee Broom Crescent pendants. A sense of flow was taken into careful consideration for this house; the entry leads straight into the kitchen. 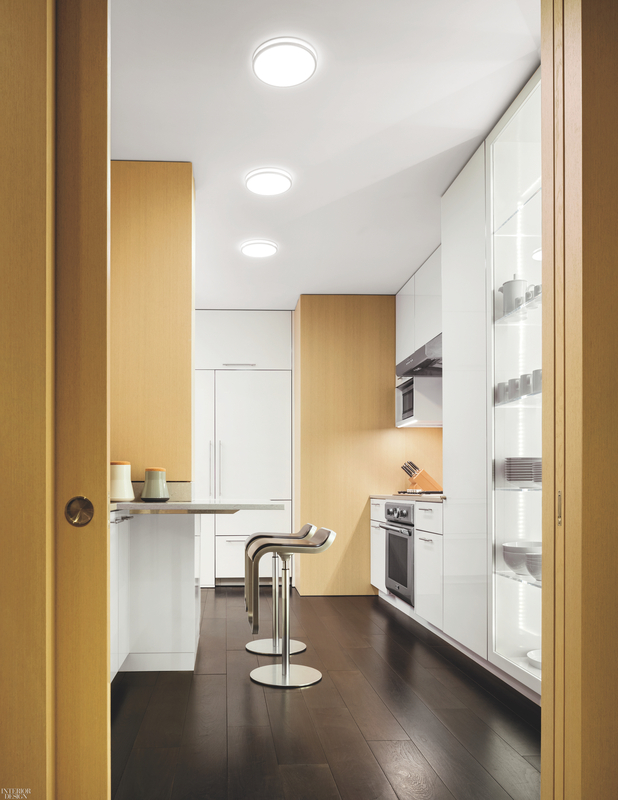 Dieter Rams' 606 system defines the pantry, and a sliding black aluminum wall keeps it hidden. 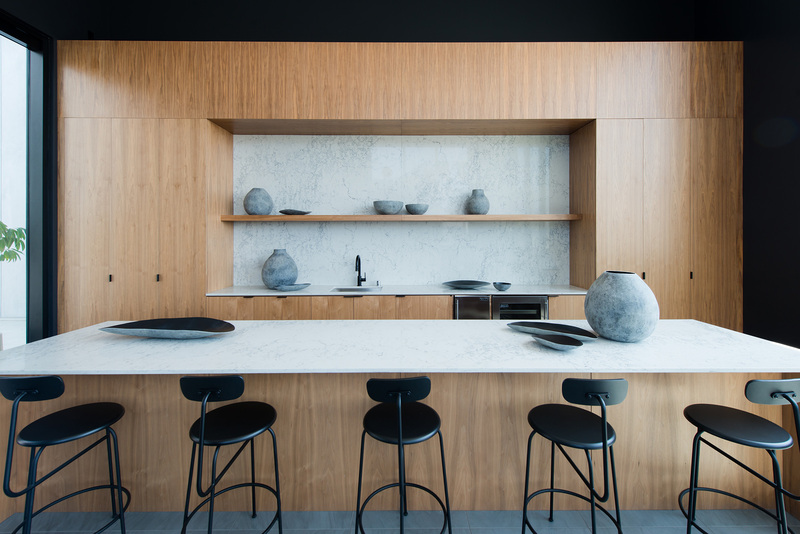 Walnut-legged stools in the kitchen are by Neri & Hu. This 2018 Best of Year winner may be small, but its materials make it mighty. 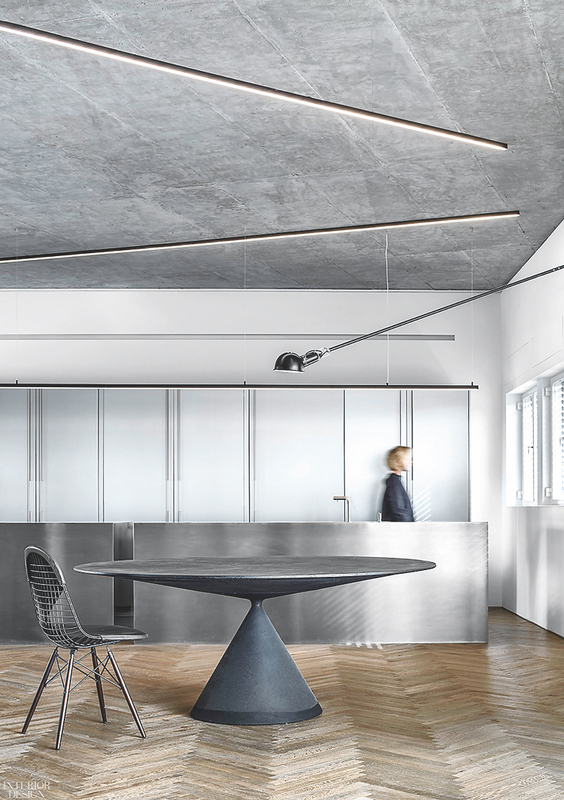 The stainless steel cabinetry adds to the apartment's industrial aesthetic. And zigzagging ceiling fixtures echo the herringbone oak floors. 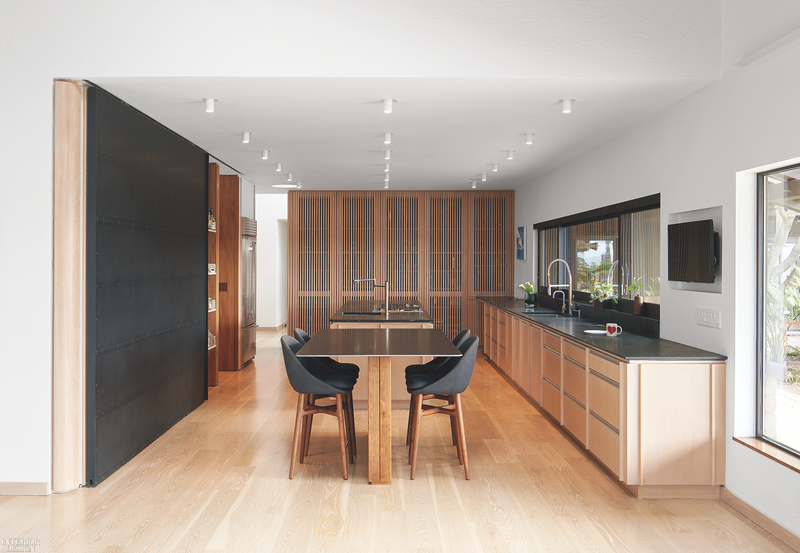 This kitchen is predominantly sustainable bamboo, with black recycled rubber outlining the main run of cabinets. The island, meanwhile, is wrapped in a composite of quartz. A photo­graph of an Icelandic glacier, printed on acrylic and backlit by LEDs, surrounds the kitchen sink. Another 2018 Best of Year winner, this residence played musical chairs with the rooms. 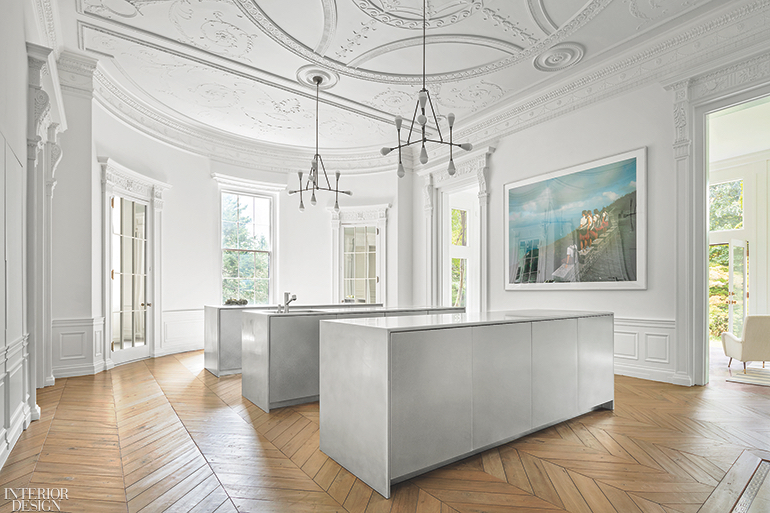 What was once an ornate music room is now the kitchen, with minimalist cabinetry inspired by Donald Judd works. Black and white dominate this home, but accents of gray and brass keep it fresh. The kitchen mixed heather-gray cabinets with two kinds of Calacatta: an island and countertops of Calacatta Gold and a mosaic backsplash. Natural light floods the design duo's home through windows and skylights, so they chose grays and woods to ground the space. The island is a single piece of concrete. This hilltop aerie feels like a treehouse. In the kitchen, cabinetry veneered in white-washed oak coordinates with stools by LAM Design Studios, and the cleverly mirrored back wall reflects surrounding nature. Jansen built nine cylinders of this home as separate “cocoons,” each devoted to a different function. 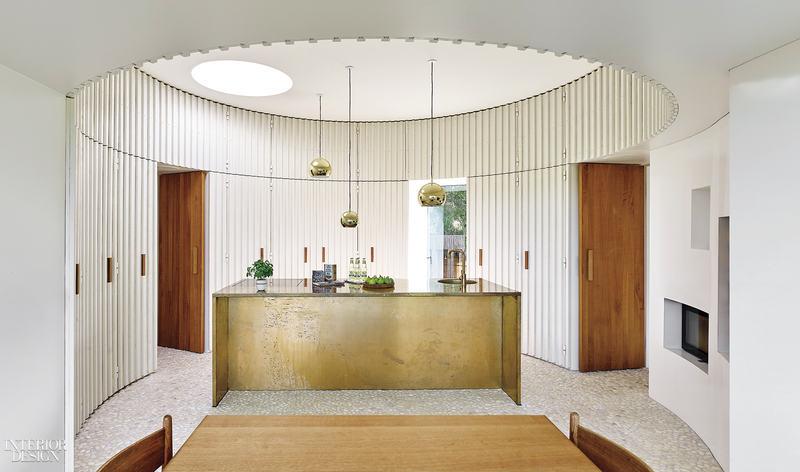 Spherical brass pendant lights designed by Benny Frandsen in the 1960s illuminate the kitchen island, which is also brass. 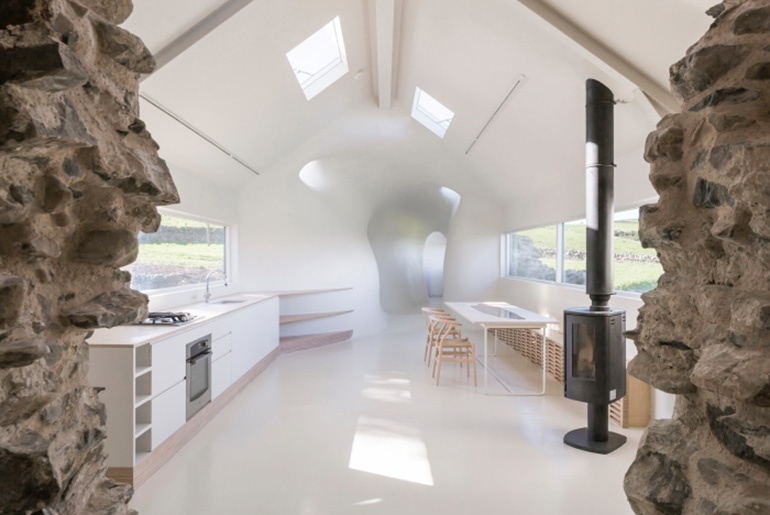 Virtually off-the-grid, this house is making as little impact as possible on unspoiled countryside stretching for miles. With the huge windows, the white surfaces, and the northern latitude, the lights don't need to be turned on until 10:00 PM in the summer. Because it's in Chelsea, art is the main focus of this model apartment. 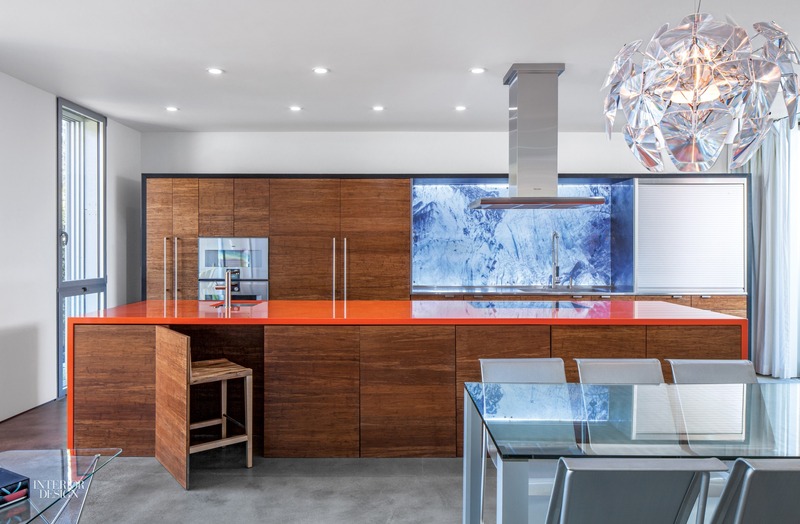 Karen J. Revis’ silk screens on paper brighten the kitchen, with Reza Feiz BV stools from Property. The environment of this home combines fine craftsmanship with the Corbusian notion that a house is a machine for living in. Four volumes throughout the apartment not only impose order on the fluid plan but also conceal structural and mechanical elements. One such volume is the kitchen, around which safety glass and oak form an enclosure. Michael Morrow wanted to bring the sun into this home as much as possible by installing skylights throughout the house. 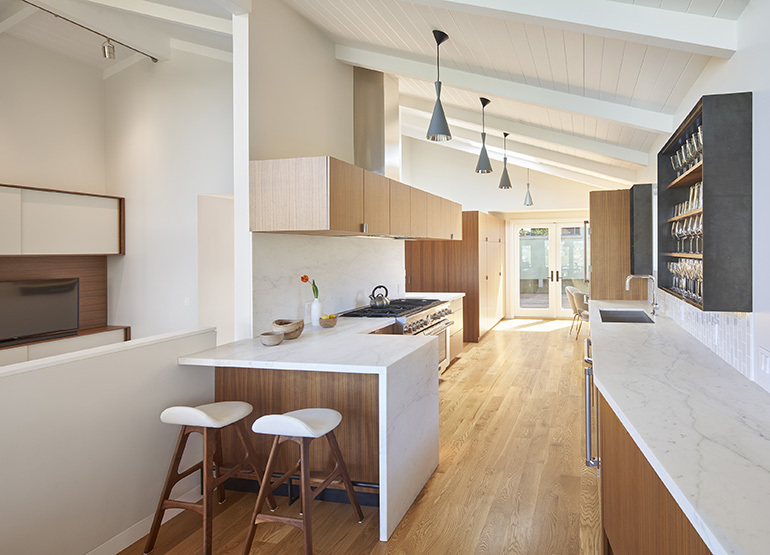 The kitchen's appliances are concealed in the quartz-topped island, and stools are by Jeff Covey. One wall of the kitchen—glass doors screened in cedar slats—slides completely open to a side courtyard, funneling in the superlative New South Wales sunshine. 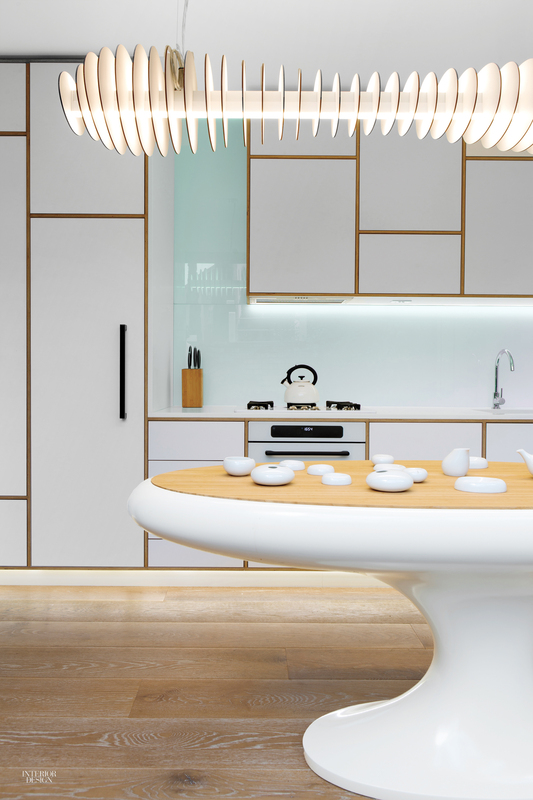 A porcelain tea set by Speziell graces the bamboo top of the kitchen island, formed of fiberglass-finish CNC-milled foam, a custom design by LAVA director Chris Bosse. The setting of this California home was gorgeous, but the interiors needed a rethink. In the kitchen, custom walnut veneer cabinets line up above counters topped in Calacatta marble. The vitrine is custom blackened steel with walnut shelves by Melissa MacDonald Metalworks. Art Group oversaw reconstruction of the exterior, including attic overhangs and a new rafter system that updates the classic chalet style with modern touches such as LEDs embedded in the beams. 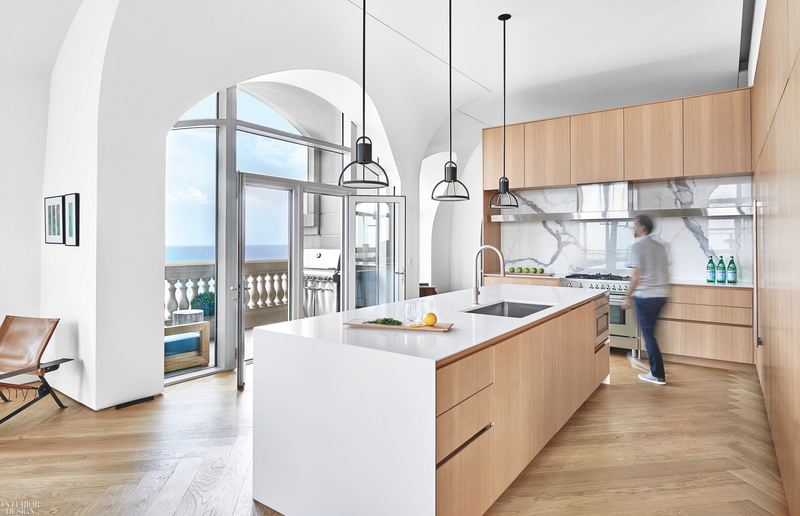 An island and cabinets by Fabel define the kitchen, behind the dining area’s Sancal table and chairs. This project took nearly three years to complete, and the result is both elegantly simple and spectacular. Long one of Yovanovitch’s preferred “noble” materials, wood—in the form of oak, pine, spruce, and larch—provides warmth, a lively range of natural colors, and a link to the chalet tradition. 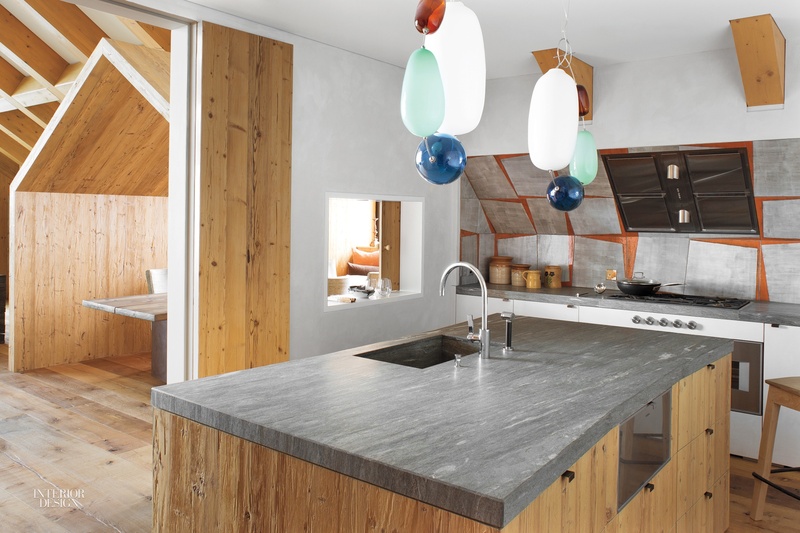 In the kitchen, Hely blown-glass suspension lights by Finnish designer Katriina Nuutinen illuminate the island’s quartzite countertop. Furnishings in this gut-renovated apartment are a streamlined, mid-century modern and contemporary mix. Stools in the kitchen are by Shin and Tomoko Azumi. Tucked into the building’s mansard roof, the 4,000-square-foot space sports arched windows and doors that frame jaw-dropping vistas of the lake and skyline. Not to mention the five outdoor balconies, one of which connects to the kitchen. 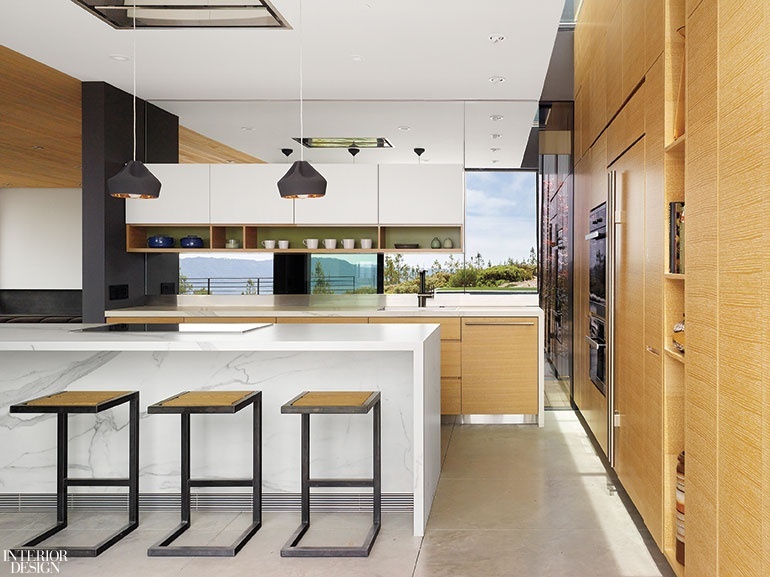 A quartz island and porcelain backsplash distinguish the open-plan space. Hotel touches abound in this luxury residential building. 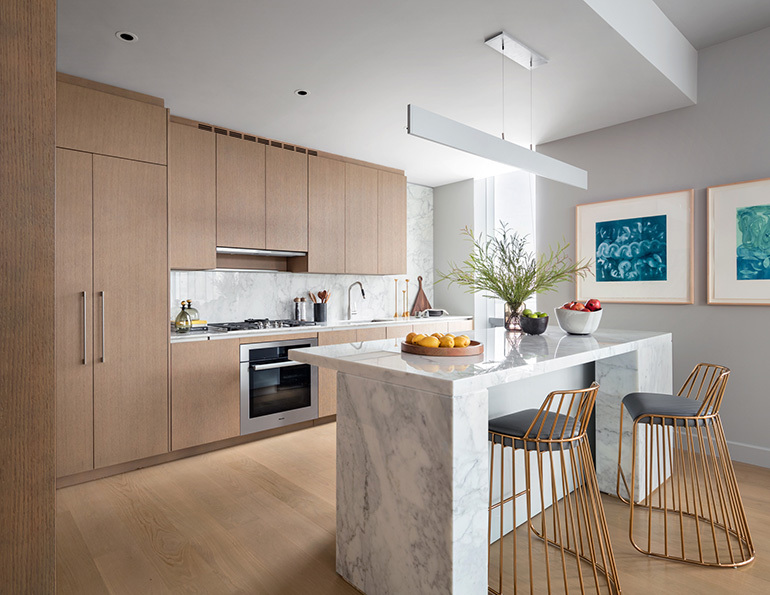 In the Sky Lounge, a kitchen area is defined by custom walnut cabinetry and a backsplash and countertops in porcelain. Can't get enough kitchens? 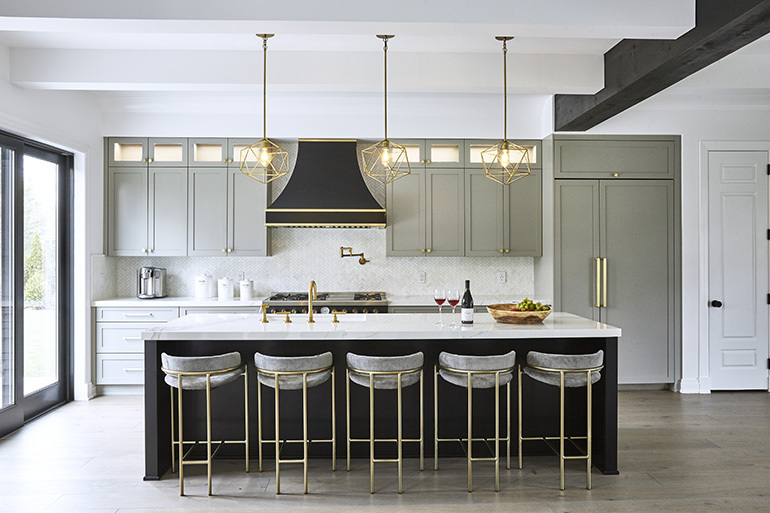 Check out the 2018 Best of Year winner for Kitchen/Bath project. We've also got the scoop on the latest products from KBIS 2019.